What's more important than your family's health? If you notice signs of allergies or respiratory problems, do not hesitate to contact our expert air duct cleaning company. We offer excellent cleaning services, which also include the perfect cleaning of HVAC units, dryer vents and ducts, air filters and the ventilating system. Our company has fully equipped vans and our team works thoroughly. 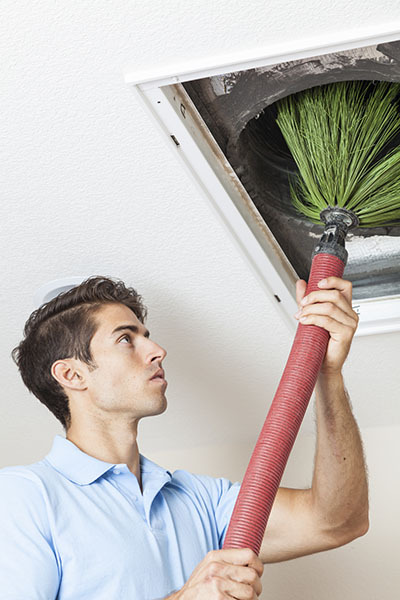 We clean every part of the ducts and promise to remove the dirt, which has been gathered there over the years, efficiently. We also remove allergens, dust mites, fungi and bacteria. We deliver a healthy, purified and refreshed environment. While modern appliances are generally efficient they need maintenance to retain their effectiveness. The flexible dryer vents can be problematic with seals and joints working loose and tears forming in the vents themselves. Tears mean access to things that can cause a blockage to the dryer ducts and even things such as mice and birds have found their way into dryer vents. That moisture then becomes humidity which can be expelled into the air outside. The problem comes if anything blocks the route of passage, the dryer vents. The first sign of a problem will be when a load has not completely dried in a single cycle. It means that the moisture turned humidity has not been able to escape almost certainly due to a blockage. The consequences can be the formation of water in the low points of the flexible venting and possible leakage into the room containing the dryer. Condensation is the likely outcome which can cause mold and damage to woodwork as well as being frankly unhealthy; the atmosphere of the room may become very unpleasant. We will check the whole of the dryer vents to ensure that the system is airtight before cleaning out the vents themselves using a vacuum. One of the things we are likely to find is lint which has come from the clothes. Some stays in the drum and is easily retrieved; other gets drawn down the dryer vents and attaches itself to the walls. The removal of lint is important because it can be a fire hazard, particularly if the dryer has a pilot light. Dryers work at high temperature in order to be able to do their job; lint is prone to catch fire and that can be a nasty shock to someone who goes out with the dryer still running and returns later. As a service company we pride ourselves on the promptness of our response and the subsequent work and advice when on site. Reputation is everything when it comes to appliance maintenance and we will go through a few points that you can keep an eye on between future visits we might make. The removal of all accessible lint is important; a busy dryer can see this lint build up fairly quickly unless you are careful. Major blockages need more than lint and so it is useful to keep looking to make sure that joints and seals are air tight because this , together with tears in the flexible ducting, is where something more substantial than dust can get into the dryer vents. We are happy to receive new enquiries from customers trying us for the first time. Everyone starts as a new customer but gradually we have built up regulars. We hope you will become one of those in the future so give us a call.